It is often said that if you want to know someone, you need to find out about their family. Rhinos are full of surprises, because they are part of the ‘perissodactyls (odd-toed ungulates)', which are mammals with an odd number of toes, and rhinos have three (as well as an additional, non-functional toe on their front paws). Because in this family you can also find horses and tapirs! But these are only very far cousins, since horses have only a single toe on each foot, while tapirs have four on their front paws and three on their back paws. We all know of their massive build, consisting of a big body resting on short legs. This is the next biggest land animal after an elephant, as this herbivore can weigh more than 2 tonnes, measure more than 4 metres in length and more than 2 metres in height. It is short-sighted, but has an excellent sense of hearing and smell. It typically has thick, smooth skin, but the rhino is indeed unique because of its horn or horns, depending on the species. 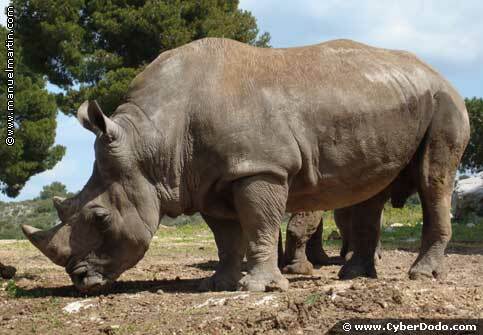 In our times, there are three species in Asia: the Java rhino (Rhinoceros sondaicus), the Sumatra rhino (Dicerorhinus sumatrensis) and the Indian rhino (Rhinoceros unicornis), and two species in Africa: the black rhino (Diceros bicornis) and the white rhino (Ceratotherium simum). But rural paintings attest to the presence of rhinos in Europe in the past, for example, the Chauvet grotto (Situated in Ardèche, France), which has paintings dating back to about 30,000 years. Is there truly such a thing as a white rhino? In fact, no-one has ever seen it! An explanation for this name is the poor translation of the South African name for this species ‘wijdlip' or ‘wijd-lip' (Which would mean ‘wide lip'), the English had translated ‘wijd' as ‘white', and the rhino henceforth became white! However, it must be pointed out that this theory is contested by certain scientists, particularly Kees Rookmaker.